If you follow theoutershores at all, you know I’m always thinking about things that wash up on the beaches. What follows is a description of an uncommon beach discovery – to be sure, it’s a new one on me. A few days ago a couple was playing with their dog on the beach and this is their account. On Friday, May 16 – at about 12:30 – on Del Rey Beach, just north of Gearhart, Oregon. While playing on the beach with our dog, we spotted something in the near distance that was flopping in the shallow waves. Upon inspection, we found a very unusual live fish. The fish was between four and five feet long, had unusual blue eyes, very sharp teeth, and a dorsal fin that looked like a sail to us. A fisherman stopped to also look at what we had found, and after we took photos, he picked up the fish and released it in the deeper water. After spending another two hours on the beach, the fish did not return. You guessed it – lancetfish; a worldwide oceanic predator. From: Miller, D. J. and R. N. Lea. 1972. 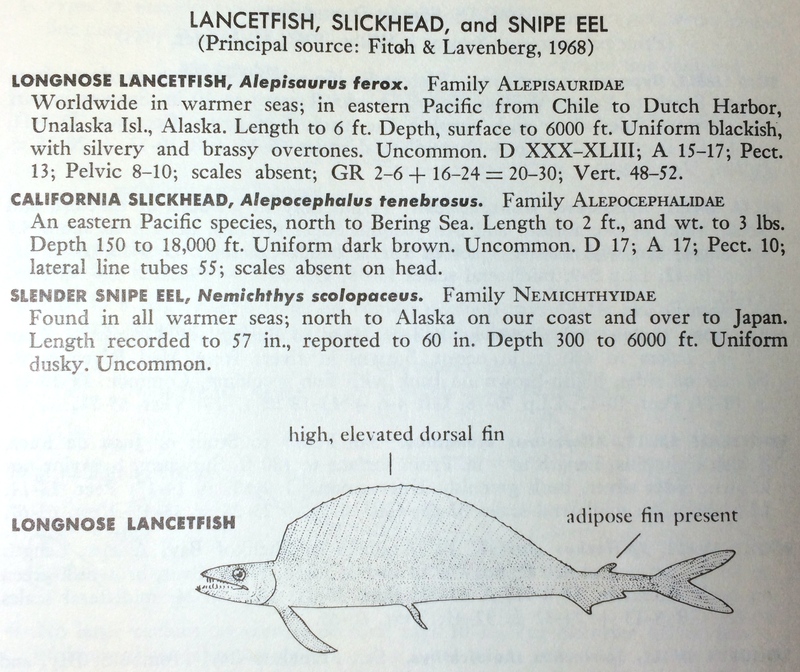 Guide to the Coastal Marine Fishes of California. California Fish Bulletin Number 157. California Department of Fish and Game, Sacramento. 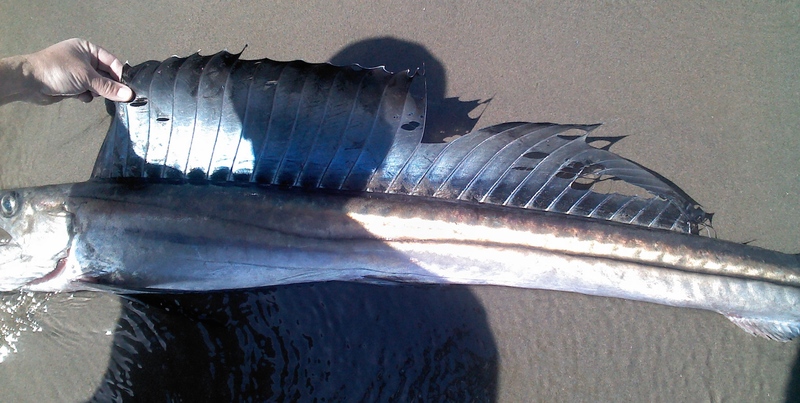 At the time of this discovery, beached lancetfish were also observed at Nags Head, North Carolina and at the mouth of the Mad River in northern California. 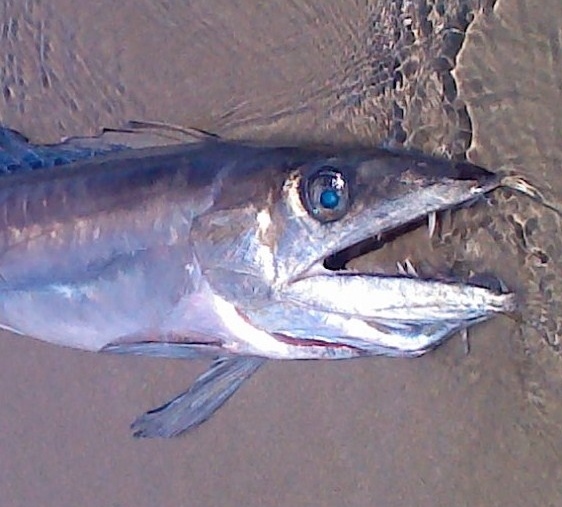 Lancetfish show up on Pacific beaches every so often, but they are so uncommon most beachcombers have never seen one. I am grateful to Mary and Sam Phillips for sharing the story of their discovery with me. Their description of the lancetfish is so complete that no photos are needed to identify it – but the photos they kindly shared bring the story to life for me. All lancetfish images in this post are theirs. I also thank Chris Allen for alerting me to the lancetfish discovery and introducing me to Mary and Sam. What a great fish! Bet you wish YOU had seen it: I know I wish I had! Mike Horn would love this I bet. You know me well. Horn’s ichthyology was one of the best classes I ever took.